How to apply eyeliner after 40 and the best eye liners to use! 40+ Style » Makeup » How to apply eyeliner after 40 & the best ones to use! How to apply eyeliner after 40 & the best ones to use! Using eyeliner really isn’t all that difficult – if you’ve got the right kind of eyeliner and the right bag of tricks. Start with the right preparation for your eyeliner. Put on your eye shadow before your eyeliner. This will help the liner stay in place and prevent that smudging that makes your eyes look shadowed and messy. 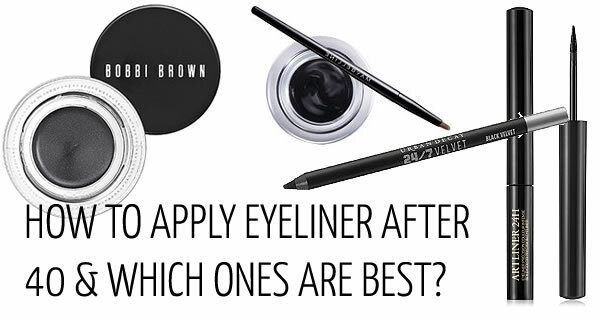 Choose an eyeliner with a thin, soft point. A very thin line will define your eyes without making you look too heavily made up. Pencil eyeliners are popular, but tend to smudge and smear. If a pencil is your go-to eyeliner, opt for one that is long-lasting or smudge-proof. Another alternative is to look for gel-based liners that will glide on smoothly and resist smudging. Use soft colours to give your eyes depth and enhance your natural eye colour. Deep plum, grey and dark brown will define your eyes beautifully, in addition to shades of blacks, blues and greens. Begin at the outer corner of your eye and move inward with a smooth, gliding motion. 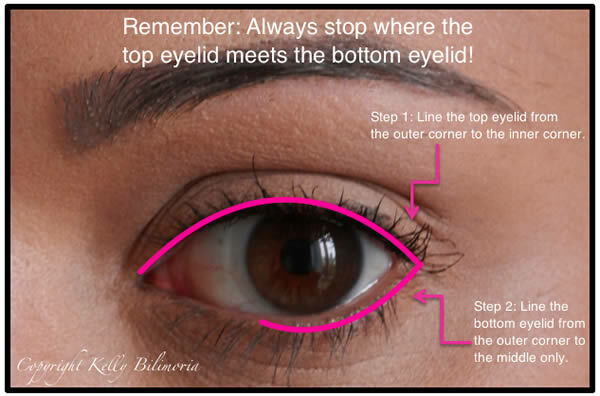 Do not go all the way to the inner corner, where the tear duct is located. Stop the line when your natural lashes stop, or just before. Hint: Don’t extend the line beyond the outer corner. If you do, it can potentially draw attention to crow’s feet or make your eyes look droopy. If you feel the eyeliner is too strong, simply wipe gently across the line with the tip of your finger or cotton bud (Q-tip), or a clean eye shadow brush, to slightly smudge and soften the line. Starting again from the outer corner, line your bottom eyelids only halfway to place just a little colour along the lash line. Bottom eyeliner tends to smear more, so a little colour goes a long way. Hint: Finishing touch – Once you’ve lined your eye along the top and bottom, brush or smudge a little bit of eyeshadow over the lines. This touch of powder will help the liner stay in place. Eyeliner Fun If you want to be more adventurous, you can create a cat-like eyeliner by applying eye shadow to the outer corner of the eyes rather than using eyeliner. This creates a modern look with a soft effect. Are you using eyliner? Do you have more tips to add? Kelly is 40+Style’s makeup and beauty expert writer. She is a professional makeup artist currently residing in Singapore. For more information or bookings contact her through her website. great post! I like a thick gel! Is it best to put the line on the eyelid as close as possible to the lashes? I’ve tried to do this and find it difficult to do without there being a gap. Next post: Trying something new with a fuchsia puffed sleeve blouse on white!